Troika is the core system for all our employees’ everyday work. We’ve worked with Troika since it was first developed and as our business changes, it’s good to know that we have a system that continues to move forward with us. Whether you offer multi-family services or concentrate on a single family; or if you provide concierge-type services or manage complex assets across a broad range of products – Troika is flexible enough to support your office, however it operates. Troika makes wealth management easy. It is a sophisticated piece of software that can be tailored to match your specific demands. It comes with the assurance that thewealthworks will work with you to improve and grow the product alongside your changing demands. Troika keeps the focus on the family. Troika helps you to improve communication with your clients and provide relevant, high quality information for them, through maintaining full records of all family members. Watch your administration costs reduce as Troika can perform in-house many tasks that you currently outsource. Troika is capable of administering multi-funded, multi-portfolio and multi-currency client investment ledgers. Troika makes light work of complicated processes. Troika lets you easily set up advanced interest calculation routines using sophisticated rate structures. It offers fully integrated Capital Gains Tax calculations that allow you to update CGT records seamlessly with accounting transactions. Troika automatically processes dividends, interest and repeat transactions. It holds multiple cash books in different currencies. With automated tasks and powerful administrative processes, Troika will free up valuable time to focus on more profitable activities. It automates many of the day to day family office tasks, making your office more organised and productive. You will benefit from automated corporate event processing for de-mergers, take-overs and re-organisations. You will be able to automatically generate letters and documents that use standard Microsoft Word templates. It helps you to efficiently manage and track due dates, tasks and workflows. 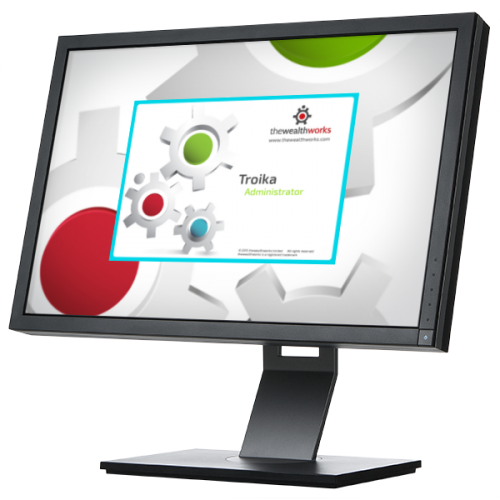 Troika gives you abundant functionality for recording, reporting and reviewing workflows. Troika lets you record and track the status of each set of accounts as they are prepared and handles flexible accounts generated in any format or style. It offers bank reconciliation options to assist with matching records to statements. Troika allows you to record and review compliance targets and key documents. Troika provides you with powerful investment management tools for performance measurement and asset allocation analysis. It gives you the flexibility and the advantage of standard Microsoft Office integration, and the reliability of the Microsoft SQL Server platform as the core database.